A few weeks ago, I posted a link on our Facebook page to a John Buccigross article that helps new (and existing) hockey parents understand what to do, and what not to do, so that everyone enjoys the youth hockey experience. Essentially, it gave some simple reminders to avoid becoming “that parent”. Shortly thereafter, I sent a note to co-writer Kevin and suggested we start a list of backyard rinkbuilder commandments. We went back and forth, and the collaboration is what you see below. But we want to know what you have to say. So as much as this is a blog post, it is also a sounding board. Add your backyard rink rule to the comments section below. Consider it your contribution to all the new, first-time rinkbuilders who will visit this site in the future. After you’ve added your bit of knowledge, share this list and hopefully we can provide a framework to help rinkbuilding rookies avoid becoming “that parent” with regards to their outdoor slabs. 1 – The Friday after Thanksgiving is International Build Your Rink Frame Day. Enjoy it. Everyone is home, so make it a family event. The kids will enjoy the rink even more if you let them hold your cordless drill for a few minutes on a Friday in November. Once they get older, make them lug the plywood. 2 – “My yard is pretty flat” is first-time rinkbuilder code for “I’m totally screwed once the water tanker is here, I just don’t know it yet”. Take the time to properly determine the slope of your yard before your first season begins. You can get pretty creative when trying to think of ways to explain to your kids why half the rink is two feet deep while the other half still has the liner flapping in the wind, but it’s best to avoid that situation altogether. 3 – If your hose has been running for more than 13 hours and you still don’t have your entire liner covered, look for holes. If you find one, swearing is not only acceptable, it’s encouraged. 4 – You change your oil every 3,000 miles, you replace your shoes once they’re worn, you change the bathwater between bubble baths, so get a new liner every year. If you’re worried about being green, find a creative way to reuse it. For every story of someone reusing a liner with success, there are three other sets of kids who had to skip a year on the backyard because dad tried to save $150. Times are tough, I know – so budget throughout the year and set aside $3/week. Even better? Teach the kids some fiscal responsibility by having them collect cans for recycling or running a lemonade stand to pay for part of it. 5 – If you build a backyard rink, you MUST clear it once it snows. This is not an option. If you build a rink and let junior skate around for two weeks, then ignore it once the first January snow storm hits, you are a horrible, lazy parent. This is a fact. 6 – Fire pits extend not just the length of the skating sessions, but also the size of your audience. Grandma loves little Johnny, but she’s not standing outside watching him skate for two hours without some heat. And some whiskey. Providing both is your responsibility. 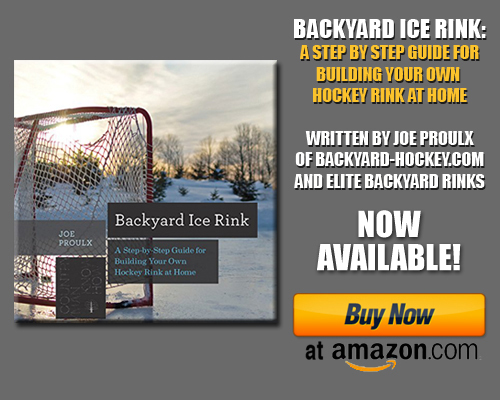 7 – There is no such thing as checking during a backyard rink game. Except when a kid runs into an adult. In that case, do your best Eric Lindros impression and watch as your four-year-old Scott Stevens belly laughs so hard he falls down. 8 – Your wife will let you do whatever you want with the rink as long as you convince her that it’s for the kids. Even if it only kinda is, and even if you end up acting like one of them once you’re out there. 9 – On cold days, dress the little ones in layers. Buy a thin headsock (like this one, which my son has worn for years) from a hiking store and make their helmet a bit larger so it fits. The fun you have on the rink is directly proportionate to the number of times the kids answer “NO!” when mom yells “Are you cold?” from the kitchen window. 10 – You can’t make a little kid enjoy a backyard rink the first time out. But you can have them hold your stick as you drag them around, calling them “the human Zamboni” and help the process along. 11 – If your neighbors complain about the “noise” coming from your rink (kids laughing, pucks hitting posts), then it’s time to get new neighbors. Better yet, invite them over for a skating party and let them see what the fuss is all about. All of that said, be courteous after dark. A puck hitting boards is approximately fifteen times louder after 8pm. 12 – The world may disagree, but it is NOT insane to lay down a layer of ice with a garden hose at 11pm in the middle of January. In fact, it’s the best time of the day. Many of the world’s ills have been cured by a man with a hose and an hour to himself under the stars. 13 – The most economical beer cooler in the world is a snow bank. Use it liberally and feel the rush of green living with every sip. 14 – Before mowing your lawn for the first time each spring, you must meticulously search your lawn for lost pucks. You’re bound to find at least a dozen. If your children are 10 years old or older, double it. 15 – Skating by yourself at night is one of the most therapeutic activities one can partake in. Millions of people pay $80/hour to sit on a leather couch and talk about their problems. Most could benefit from an hour with a pair of worn-out Bauers and a Sher-Wood. So that’s our list…tell us what we missed in the comments and help your fellow rinkbuilders out! 16) If you don’t help shovel, you don’t skate. 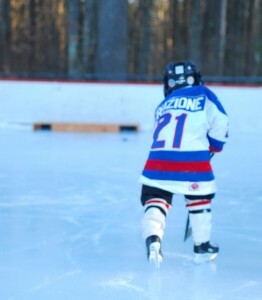 17) The low temperature for kids on the pond is -20 degrees. Once it gets any colder than that, it’s time to get in the house. 19) Everything, and I mean everything, you take down to the pond comes back up to the house. 20) The dog is NOT a goalie. 21) Make sure your wife knows that you will be ‘taking some time off’ and ‘seeing another woman’ for a couple of months (Dec-Feb). ‘She’ is your rink, and you’ll give her more attention and love than you initially think you will. 22) It may seem like a timesaver but never put your liner in before you are ready to flood as liners without water in them are magnets for animals with claws/hooves as well as sticks, pine cones and other foreign objects. 23) Don’t plan business trips to the west coast during likely flood times/blizzards unless you have an understanding spouse or devoted (and nearly adult child). If you happen to have an understanding spouse expect to lavish expensive gifts on said person upon your return. 24) Unattended pucks and foreign obects will sink into the ice on sunny days! 25) If you’re not having fun, get off the ice. 26) Building in the evening shade, let’s mother earth be the Zamboni in the morning as the sun rises, and let’s the rink last a lot longer into the spring. 27) Taking shifts to tend the ice and flood it overnight with your brother(s) is a rite of passage. 28) Keep leaves/debris off the ice. When the sun hits these they can make a hole/divet quick. 29) Make an ice skating path from the house to the rink. It makes life easier to dress/undress inside or in the garage (AKA the locker room). Just watch out if the patch includes porch steps. After three years of shoveling, make an investment in a snow blower. totally agree with my yard is pretty flat. I built my first rink this year and learned my yard is not as level as i thought….Its okay to build a rink when your 30 and have no kids right? 33) Your wife will ask you to shovel the driveway before you shovel the rink. Always clean the ice off first. The rink will love the attention and look great. Your wife will look good in the spring and need attention from all the working out she has done all winter, while you were outside. Proviso to #7 – if it is just the fellas, the amount of body contact is directly proportional to the amount of beer/alcohol that has been ingested. Addendum to #13 – A snowbank is a great beer cooler; it is also a great beer insulator when it is -20C and you don’t want your suds to freeze in the open air. Nobody likes a beer slushie except the dog. If you have bumpy ice you tried to take a short cut by either a) not getting the ice clear of snow/scrapings before flooding or b) putting too much water on at once. Water expands as it freezes, and freezes from the top down. Too much water means unfrozen water between the ice sheet and newly frozen ice on top—-> the middle has no where to go as it expands except up—–> bumps But hey, it will make you kid a better skater and stick handler! I have been thinking of renting extra ice time because my 6 year old doesn’t think 7 hours of ice time a week is enough practice(and for him it isn’t)but now I am really thinking of building my own rink for my boys. BTW I am the wife but I will be the one out there, building, maintaning ang enjoying the ice with my boys. P.S. I would not have thought of a firepit because I plan to be on the ice, but then maybe their Dad will watch for a bit. #35 – Dedicate one night as “Public Skating Night” and invite over some friends and their kids and play some music….it is a blast! #36 – It is highly recommended that sticks, pine cones, and other debris be picked up before the tarp goes down. #37 – It is highly recommended that dog poop be picked before the boards are setup! 1st year rink builder . Rink is filled. Waiting for the cold weather. Unfortunately, made a rookie mistake. Slope is bigger than I thought. The average depth is about 5 inches , but in one corner it is about 15 inches. Any advice out there is appreciated. Very concerned that the corner will not freeze. Does it have to freeze to the liner? Vinnie : snow rakes work well if you have a frozen top layer and they reach out 17-20 feet without stepping on a partially frozen surface. I would recommend the 24″ true temper with a telescoping handle and a poly blade (http://www.homedepot.com/buy/true-temper-17-ft-telescoping-roof-rake-193055500.html#.UOJCLibo-lY) the poly blade avoids bringing a metal roof rake to your liner and the telescoping handle is a definite nice to have. Roof rakes will run ~$50. Dave : It does not have to freeze to the liner in the deep end. the ice will float on the water and as long as you have 3-4 inches of frozen ice on top you will hold skating weight (like a pond). when you get some melt on the edge of the surface you may see wet spots as the weight of skaters can push water up on the edges due increased pressure of the load on top of the ice, this will refreeze as the sun sets and the temperatures drop but will likely give you some pause in starting a game. This is my third year building a rink in Manitoba. Even though I would gladly do it myself, my now 15-year old son has to take the lead this year to get me to work on it. We do it with just snow and a gradual spray build-up of ice until the base is “water proof” and then we flood with barrels and hose to get a bit of water standing on it. We edge it with 2×8 planks that are just iced into place (no stakes or brackets). We start in mid-December and should be skating on it in early January, but it all depends on how frequently we add water. Maybe next year we’ll try the “seal and fill” method most websites recommend.